Pea shoot (豆苗) soup - pretty good. …which were dipped into this… but I can't quite remember what this was supposed to be. Summer snow (六月雪) - hempseed (火麻仁) tofu, with soy beans and coriander. Stone ground crab rice roll (活蟹石磨腸粉) - pretty interesting and soft texture for the rice flour roll, and the crab meat and roe wasn't bad. But the dish came with part 2 on the same plate: homemade noodles with leafy amaranth (莧菜) and beetroot, stir-fried with egg, tomato and salted radish (蘿蔔乾). Pretty interesting. Unfamiliar due to the unusual noodles, yet somehow they taste homey to me thanks to the fried egg and tomato - something my mom does at home a lot. A wonderfully roasted chicken with thin, crispy and delicious skin. I still think this can give Bresse chicken a run for its money. 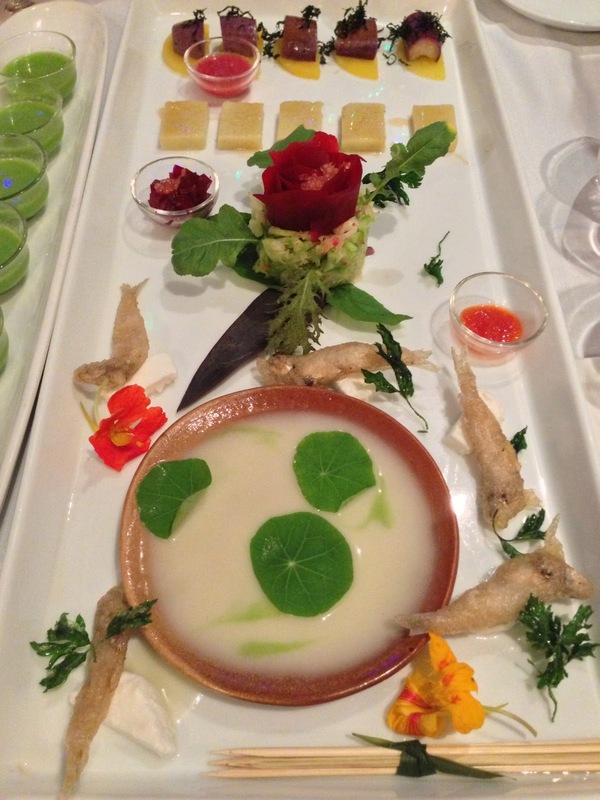 Oh and that organic galanga (沙薑) dip… Yum. Soup without water (無水燉湯) - chicken soup with mushrooms. Very yum. Bowl of urchin pudding (水鄉海膽糕) - mixed with sweet potato starch and stir-fried. I'm still not a fan of some methods of cooking sea urchin, and this time it definitely brought out the strong "fishy" taste. Ice plum crab (冰梅蟹) - 2 blue swimmer crabs. Love that they're done with the homemade plum wine. Unfortunately the flesh was too mushy, and I prefer my crabs fresh and firm. Seafood Yin Yang rice (生死戀) - this was a far cry from the version I had last time, and I really miss the wagyu. Once again there was rice baked inside the cuttlefish, with squid ink of course. Unfortunately the whole thing was rather bland, so I ended up putting some chopped chili on top… And I didn't get why there was so much ginger. Not your chopped chill fish (點只剁椒魚) - what a treat! I've had flying fish roe before, but never the actual fish itself. Margaret explained that one doesn't see live specimens in the markets nowadays, so she grabbed these as soon as she saw them. The flesh was actually a little tough and chewy - polar opposite of the garoupas and other coral fish that Cantonese love so much. The chopped chilies were pretty hot, at least for me. Our organic vegetables (種了有機菜) - there were four kinds of veggies here, including morning glory shoots and choy sum (菜心) shoots. Wonderful stuff. Mulberry egg tart - cookie crust. 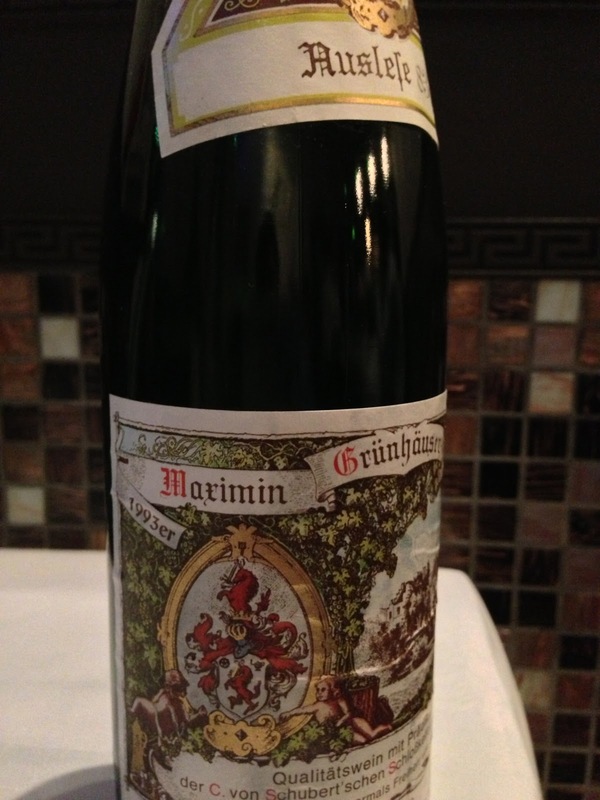 1993 von Schubert Maximin Grünhäuser Abtsberg Auslese 83 - nose of citrus lemon, plastic and white pepper. 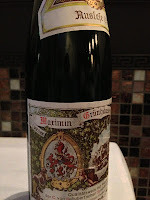 Perfect balance of acidity and sweetness. 1997 Sandrone Cannubi Boschis - pine forest, fruity and sweet, smooth on the mid-palate but with a tannic finish. 2003 Yquem en demi-bouteille - really sweet on the palate. Viscous like honey. Nose of orange and acetone. Not all the dishes are hits tonight, but there were certainly enough of them. I also really appreciate Margaret's efforts at going organic and local. Have got to say I haven't visited here as yet - but I am already liking the carefully constructed components and recipes.